Okay, it seems there is some confusion. Our new site has been up and running for a while now but although the actual address is the same, it is not the same as the one you see in your address bar right now. www.lovedalready.com had previously been forwarded to this blogspot.com page but is not any longer. Therefore, if you want to see the new site, go to just plain www.lovedalready.com with no ".blogspot" in it. Leep a look-out for our new website coming soon! Same address, nothing changing except the look and functionality. We will have information about Ukraine as well as some family pictures (Yay!) and, of course, we will continue to update the news of our progress in the adoption. Not eco-friendly by any means! Why can't they make a family car that is easy on the gas mileage? Maybe one that runs on the vegetables that the kids won't eat? Settle in, I apologize ahead of time--this is long! Wow! Yesterday turned out to be a pretty crazy birthday! We left the house in the morning and went to Loudon. There we got our criminal backround checks completed and got the birth certificates for Ivy and Annette which we had not noticed had never been ordered until now when we are needing them. We went to McDonald's for a birthday lunch and the girls even spent a few minutes on the playground (even though it was 29 degrees out)! 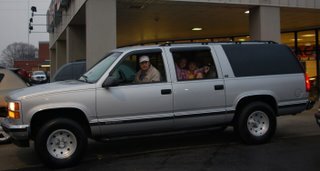 On the way to McD's we saw an 8-passenger Suburban for sale at a local lot here but were too starving to stop. After lunch we went back and figured we'd take a look. We were looking to buy used but it was a '95 and we weren't expecting much. We looked it over and were impressed, it was in good shape outside and in! We didn't have a lot of time since we had and appointment to meet with our pastor at 3:15 and it was already going on 2:00 but we thought we could squeeze in a test drive. 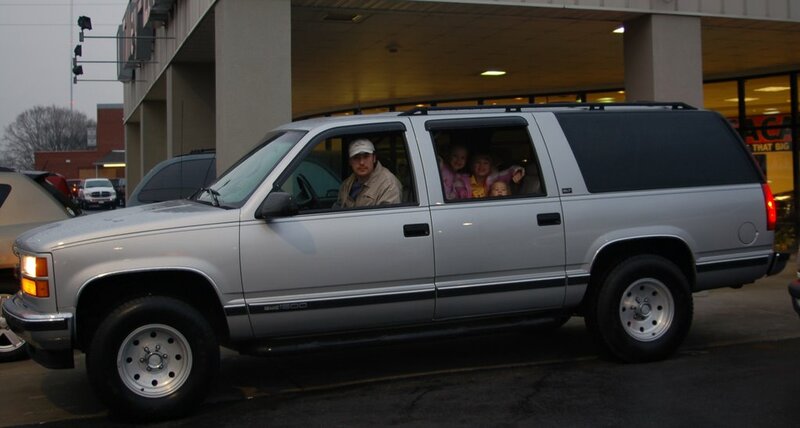 I packed the kids and car seats in and we took off. Steve headed right for the interstate and the dial was at the 'E'. I thought (aloud) that maybe we should go and get a few dollars in gas just to be sure. Well, you can guess the rest, the car was great, handled well, everything seemed to be working and then about a mile from the exit we ran completely out of gas! We were driving a HUGE vehicle up a slight incline and couldn't pull off and ride the shoulder because there was a big truck parked there so we silently coasted on by him with our blinkers on, the kids in the back oblivious and us up front, laughing at our predicament and watching the road. The slight incline turned into a blessing when we crept over the its crest and were able to gather a little speed assuring us of at least making it to the exit! We didn't dare come to a complete stop at the end of the exit despite the fact that there was no real break in the traffic so we coasted around the corner on the shoulder and into a gas station that was in the perfect spot and with open pumps! Once we stopped, we couldn't stop chuckling to ourselves! It was so funny! We took the car back and talked a bit to the sales people, telling them why we were "upgrading" sharing a laugh over the empty tank and also explaning that we had no time to talk right then but would call them if we were interested. The appointment with Dr. sager went well. Steve told him our plans to adopt and also talked about his plans for the future, how he would like to see our church get involved with helping and even encouraging couples to pursue adoptions. Brother Doug (that's how they refer to their pastors down here) told us of another man in our church with a similar passion and gave us a number to contact him. I am interested to see what comes of speaking with him. After our meeting, we decided we would call the car dealer and offer him a very low price, expecting a counter-offer. They were asking $5,995 and we offered $5,000 including everything. Of course the guy said he was sure that wouldn't work but he would ask whoever it is that they ask. We were shopping in Big Lots (getting my Birthday Bunkbeds!) when the salesman called back and said, the owner thinks it is great what you are doing and he wants you to have it at that price. Can you come back tonight and sign the papers? We were shocked. I wouldn't have thought that they would have payed much attention to why we were wanting it as we had only mentioned it in passing. We had the cash but not in the right account so we offered to pay with credit but they said they couldn't do that because they wouldn't be making any profit on this one and couldn't afford the 3% fee that would cost. So we are going back tonight with a check from the credit card company which will allow us to keep our funds free (since that would about wipe us out for now and in our slow season) for all these little and not-so-little processing fees we have with all this adoption paperwork. It also gives them their money now instead of after our money transfer registered which would have added a couple of days. So it appears that God has had His hand on us again and now that we have the bunkbeds and a big-enough vehicle, all we really still need is a longer kitchen table (and money, of course)! I suppose there might be other things but those are what I can think of now. Things like clothes will have to wait till we meet the kids. Steve had a class to teach last night so I dropped him and the girls off at church and went off to sign the papers on the car. I finished up just in time to go back and pick them all up and head to Little Ceasar's for a pizza and to Food City for a little $3.99 cake that was just big enough for us to not have leftovers for me to induge on for the next 9 days! We went home and had a very informal little party where the girls gave me their gifts: a bracelet from annette with the $1.99 tag still prominently attatched and a picture frame from Hannah who bragged that it only cost a dollar though it said $2.00 and also a can of floral, I mean FLORAL air freshener from her too. They were both so proud and I love to watch their excited faces as they wait for my response! We all crawled happily into bed not much worse for the wear although it was 10:00 and poor Ivy had spent the afternoon being bought off by suckers since she had missed her nap entirely! So, it was a crazy day but fun and it was great to get so much accomplished toward our adoption which is the best gift of all.